"Last year, Barnes & Noble reported that 25% of the Nook market was made up of self-published works [link]. We were curious to see if this meant 25% of the bestselling titles were self-published, 25% of the sales came from self-published e-books, or if self-published e-book sales accounted for 25% of the gross dollar market. As always, our primary concern here is where authors are doing better, sale for sale. It doesn’t help authors to say that 70% of the book market is in print if only a small fraction of that money ends up in authors’ pockets [link]. What we want to see is the combined effect of royalty rate, sales volume, and sale price. These three factors combine to give us a true picture of comparative earnings, as shown in our pie charts. 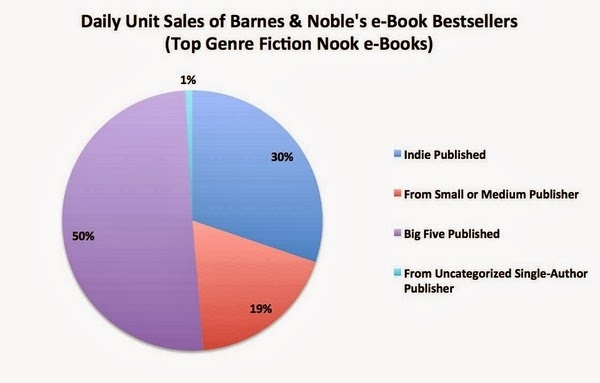 Let’s see what our spider gathered as it snared 5,400 of Barnes & Noble’s top genre e-books in its digital web:"
The number of daily unit sales are consistent with this, but the amount of daily revenue to Indie authors diverges here from previous results. In other words, while Indies have the strongest presence at B&N, they don't take home the largest piece of the pie. Hugh breaks this down by comparing Indies (1/3 of the market) with legacy publishers and their various market shares in order to show that, individually, each publisher's revenue looks miniscule compared to the army of Indie authors. This is reasonable, but what I take from this relates to something I observed on my own, long ago: Barnes and Noble kills Indie books. That's sort of a generalization, and perhaps sounds unfair, but this is what I mean by this statement: B&N does a terrible job of making Indie books available to buyers. They put Indies in a back-of-the-store type of category, with almost no visibility whatsoever. When my books were there, I could only find half of them by searching for the title and/or author name. The rest I couldn't find at all, or only could occasionally. In other words, B&N went out of their way to make Indies use the back entrance, whereas Amazon.com treated Indies the same as any other publisher. Naturally, Indies got their foothold at Amazon and it has remained that way ever since. Some Indies do well at B&N, but most do not. In my case, this is the reason I ultimately went exclusive with Amazon. They offered me free advertising opportunities in exchange for exclusivity, which not only kept the playing field level, but helped me show my books to thousands of potential new fans. Meanwhile, B&N wanted to treat me like "the help" and pretend I wasn't there, except when it came to taking their cut of my sales. "In 2011 the company lost 209 million, in 2012 they lost 261 million and in 2013 they increased the losses to 475 million. If we look at the quarter ending on July 27, 2013 they reported loses of 55 million and October 26, 2013 NOOK lost 45 million. If you add all of these figures together it comes to over 1 billion dollars." Emphasis mine. B&N lost one billion dollars from 2011 to 2013. This isn't necessarily directly related to my experiences with them or their treatment of Indies in general, but it speaks volumes as to B&N's difficulty in choosing a direction for their company. Or an executive to execute that vision. Which I find unfathomable, considering they've got a perfect template to follow in Amazon. Even lacking a consistent vision of their own, B&N could do just fine if they would accept that we've had a disruptive revolution in the industry. They could embrace these new technologies (including POD and espresso printing machines). So could big publishers. Yet, rather than develop a new visionary direction based on modern technological realities, these corporations cling to old ideas and try to stifle innovation. They spend (and lose) billions in the effort to prop up an industry that 's fast becoming irrelevant. Their distribution model won't mean anything once all paperbacks are POD and 90% of books are published electronically. That day might be ten years off, or even twenty, but its coming, and it will be here faster than anyone thinks. Don't think so? Hugh Howey, Indie author of the popular "Wool" series is used to surprising us. He did it when his meek sci-fi series about a post apocalyptic future where people live in silos became an international phenomenon. He did it when he signed a lucrative publishing deal with a major traditional publisher, but managed to hold all of his e-book rights. Now, he's done it again. Or the fact that while traditional publishers do make the lion's share of profits, their authors earn only 32% of daily e-book revenue. 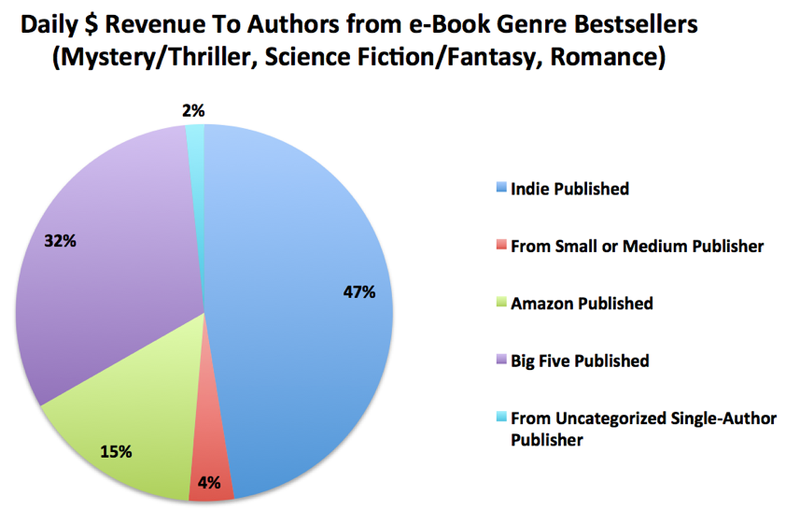 Just under 50% of daily e-book revenues go to... you guessed it: Indies. Also noteworthy are the facts that while Indie books are cheaper pretty much across the board, they tend to have better reviews... Which I find fascinating because it's a well known fact that legacy publishers use promotional services to not only boost sales and bestseller stats at launch by ordering large numbers of books all at once, but also gather vast numbers of reviews for their clients to help improve sales. Do Indies play this game? Sure they do. A few have been caught making fake reviews, not only to help their sales, but to slander the competition. 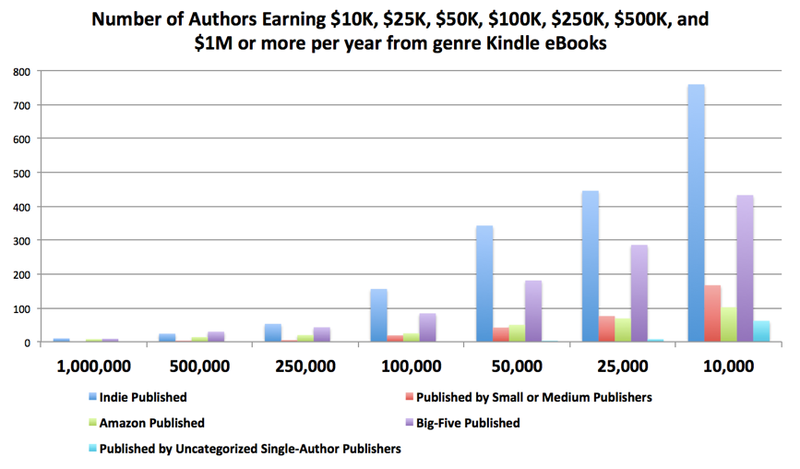 (I suspect Indie authors are not the only people in the business engaged in this race to the bottom.) But all this really proves is that sociopaths will be sociopaths, regardless of which side of the chess board they play. There's a lot more in this report, and it's far from conclusive, but it introduces a ton of information that until now was kept secret. It also challenges recent industry reports that Indies and e-books in general are an outlier, and that major publishers have nothing to worry about. Of course, anyone even close to the industry already knew that was a farce. I read about traditionally published authors going Indie or hybrid EVERY. SINGLE. DAY. And now we know why Amazon has been so comfortable about playing their cards close to the vest. They have nothing to worry about. The internet has turned out to be a liberator of not only businesses large and small, but also of artists. It doesn't matter if you're an independent author, musician, filmmaker, or journalist. There's money to be made out there, and in case you haven't been paying attention, it pays to cut out the middle man. That's something to think about when deciding what to do with your next novel. We all know that a big publisher can offer us a few things, like a cover we don't have to pay for (and therefore can have no opinion about) and space on brick & mortar bookshelves (most likely for a very short time). We also know that traditional publishing contracts are notoriously skewed against the author, and that for the vast majority of traditionally published writers, the money isn't very good. No small wonder, considering those contracts usually take your rights away forever while the book only remains on the shelf for a few months. Or the fact that most of those contracts also restrict you from publishing anything else while signed with that publisher. If you still want to go the traditional route, take a good close look at the contract they're offering. Calculate the benefits vs. what you could potentially lose. And consult a good I.P. lawyer who can advise you on these matters, and possibly even negotiate on your behalf.